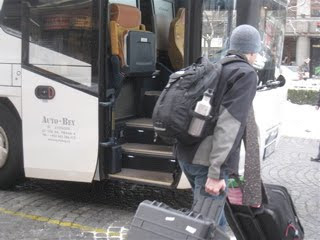 Gabe powers those CD cases onto the bus. They're lighter today, after a record sale in Prague two nights ago. We were a bit worried about the trip to Bratislava; there had been snow in the night and the road was closed a few hours before our departure. Though it snowed during our journey the road was clear and after the predicted 5 or so hours we arrived on time to grab some lunch before our 7pm performance.